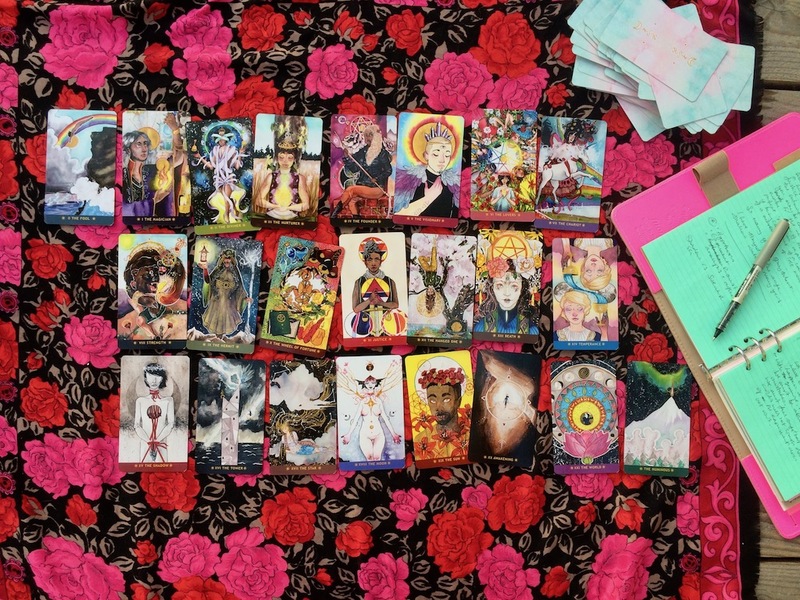 When it comes to the messy business of liberation and growth, the tarot deck we choose can make a big difference. 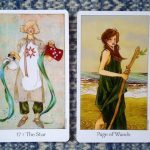 There are decks that mince no words – such as the Tarot of the Crone – handing us bare bones, stark and often harsh, trusting in our ability to steel ourselves and deal. 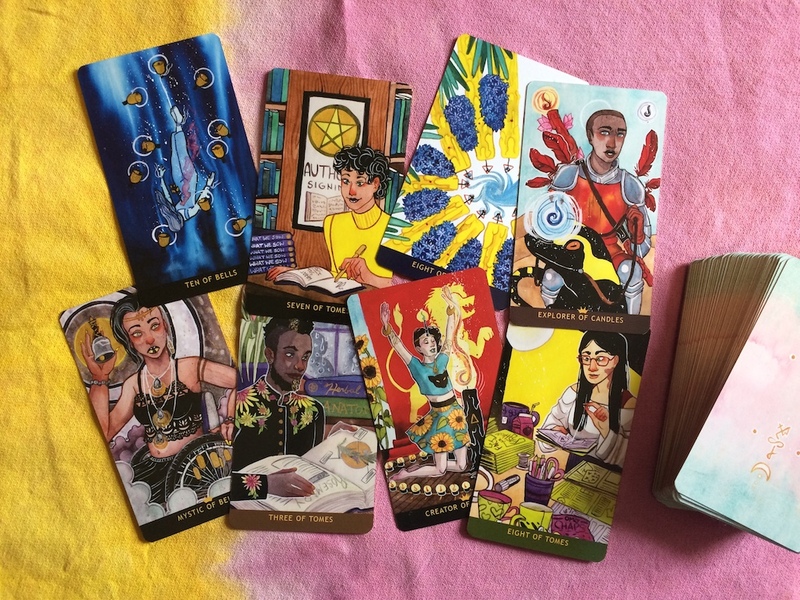 There are decks that are super soft – such as the White Sage Tarot – that gently, subtly guide us to the possibility that we may have work to do. There is a place in my practice for both of these approaches, depending on so many things – the state of my mental health, the time and capacity I have available, my location, the gravity of the situation, who is involved, my gut feeling, and so on. There are also those rare and beautiful decks that take you by the hand, reassure you of your strengths, and firmly, lovingly hold space for this kind of work. Decks that are brimming with compassion and encouragement, decks that believe in you. Noel Arthur Heimpel’s Numinous Tarot is one of these very special decks. It arrived in my life as I was taking baby steps into swirling mass of shadows and secrets, trying to find my way through, to discern what is mine and what is not, to find my way through a fog of socialisation, buried pain, fear and anger, to a place of authenticity and truth. It’s a journey towards personal liberation, fuelled by the determination to be a better ally, a more authentic activist, a person who creates change in each sphere of my life, personal and collective. I am still on page one of this epic personal ‘novel’, still gathering the language and the tools I need to step forwards. I am taking baby steps. I am afraid and brave. And I am realising that I cannot do it alone. I have so far been bringing these shadows and secrets to the lap of the fearsome Crone. Her unwillingness to ‘make nice’ making me wince at times, but always bringing me closer to my truth. 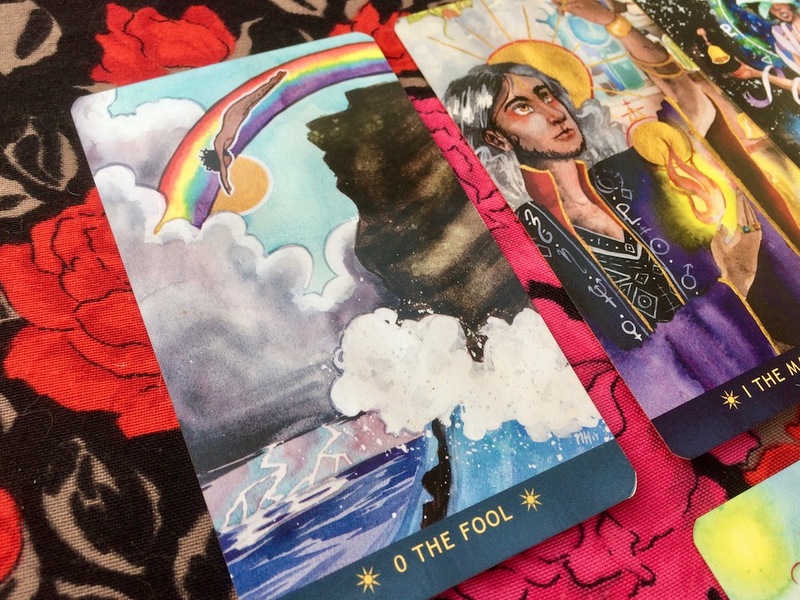 When the Numinous Tarot arrived last month, for a while I put its rainbows and glitter aside, eschewing its apparent positivity so as to stay with the Tarot of the Crone and her shadows. Of course, this journey into my own darkness has grown more edgy, more vulnerable, more tender over time. Eventually, I asked the Crone for a break. I needed to come up for air. 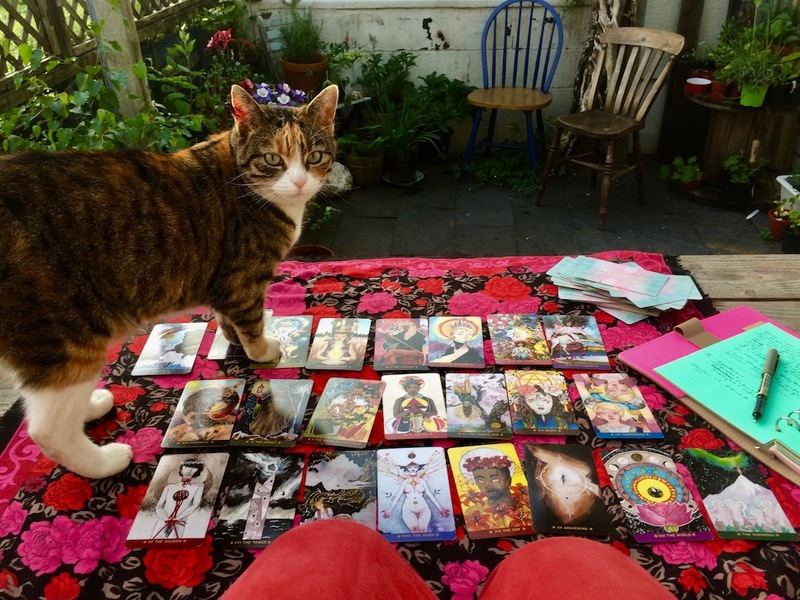 It was at this point that I unwrapped the Numinous Tarot and finally delved in. Oh, my heart! My raw and swollen heart. Each time I pull a card, my eyes fill with tears. Where perhaps I meant only to grab a quick message on my way out the door, I find myself parking it on the sofa for a read of Noel’s generous, heartfelt words, and a moment of quiet reflection. These images connect me to myself, to reality, to what I love and value and long for. In these cards, I find the scrappy, DIY magic that I practice and always worried was ‘inferior’, not ‘proper’. Here I find the un-instagramable moments of true, raw beauty, the effort, the intention, the experimentation, the self-doubt and the acceptance, the solitude and the community, the shared language and the unconditional love. Everyone is a ‘they/their’. Here I find the folks that surround Little Red Tarot, the folks who hang out in my inbox and I in theirs, the folks I share a home with, the folks I reach out and connect with across the internet. Folks I love, folks I have yet to meet. All of us doing our work, all of us striving for revolution. We meet in this deck. It is validating. It is affirming. It is supportive. It is real. There is so much magic in the striving itself. So much magic in our collective and individual intentions to grow, to change the world through changing ourselves. So much magic in facing up to the complexities of who we are, all the ways we have been socialised to feel we are not enough, all the ways we are returning to ourselves and to each other, and reclaiming our personal and collective power. Like Cristy C Road’s NEXT WORLD TAROT, this is a deck for the revolution, a deck for the shifting. A partner in The Work. Despite the colour, the light, the glitter that pulses through the veins of the Numinous Tarot, this not a deck without shadows. It’s not pretending that bad things don’t happen, or ‘lightwashing’ where it is darkness that holds the truth. It is more that, when we do face the tough stuff, it offers support and encouragement. I find it consistently brings me perspective, helping me to frame difficult experiences within a wider context, the context of movement and community, of folks who aren’t perfect, doing our best. 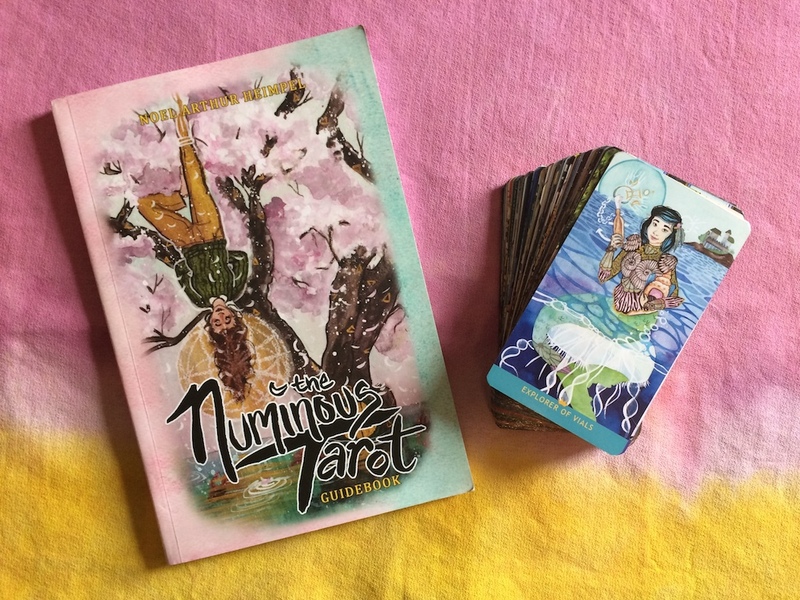 The goal of the Numinous Tarot is not just to uplift and empower, but to allow for vulnerability, mistakes, and flaws as well. We cannot be strong all the time. I spend the first 25 years of my life being “strong”, being the “family rock”, in a way that never allowed me to be hurt or to ask for help. I only found real healing when I allowed myself to be weak or scared, to be wrong, to not know the answers. These moments, as it turns out, pass. They do not last forever. The people who love and care about us (and there are such people) will be there when you reach out to them. The communities we create are so much more for us than the hyper-competitive, hyper-individualist message of capitalist American society. Along with the shadow, the support, the holding of space for the process of grief and growth, this deck is also imbued with a sense of really accessible celebration. It holds up the beauty of the DIY, the made-up, the moments and events that marginalised people make up for ourselves, that we create via an intuited idea of what joy might look like, when we give up trying to access the mainstream. The art in this deck almost guarantees that you’ll see something of yourself reflected back in its cards, acting as gateways to a glorious magical queer imaginary. There is space in the magic for you in particular, this gorgeous deck sings out. I see femme of center people, disabled people, trans people, black people, poor people, poly people, non-binary people, queer people, old people, young people – I see me, you, us; I see our community thriving and in command of our magic. In the Numinous Tarot, and other decks that do this work, I see the reality of being able to create ourselves in beauty as self healing work – as Noel did in their self-portrait as Queen of Tomes. How absolutely powerful is that? Yes, it is a deck for our queer family. And it is a deck for everybody. It is a deck that celebrates humanity and breaks down divisions. Come with love, with respect, with an open heart. You’ll find yourself here. Like the NEXT WORLD TAROT (which emerged around the same time), this deck carries stories of immense resilience. Both decks have huge, huge hearts filled with fierce love; both decks carry powerful critiques of/answers to state violence, and cultural and systemic oppression. I don’t want to get into comparing the two decks – there’s simply no need! Both of these decks in their different ways bring us fuel and knowledge and strength to become the change we yearn to see. Where I feel that Cristy’s focus is often on community approaches to resistance and activism, and her deck has a tough fighting kinda spirit, Noel repeatedly zooms in to explore the beating human heart that lives through every moment. In this way, the two decks make a wonderful pair. 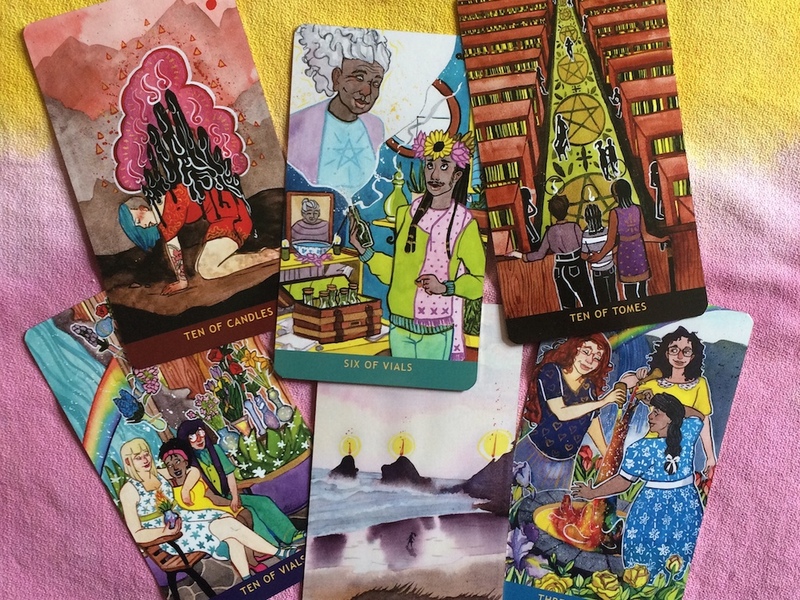 There are a few significant departures from the standard tarot structure (though tarot readers of all levels would quickly settle in to these revisions – this is not one of those decks that demands you ‘start over’, like the Wildwood or Dark Goddess tarot decks.) The four suits have been renamed: Pentacles are Tomes, Cups are Vials, Swords are Bells and Wands are Candles. The court or face cards have been freed from their traditional genders and hierarchy and and are now Dreamers (Pages), Explorers (Knights), Mystics (Kings) and Creators (Queens). A number of major cards have also been renamed so that all are genderfluid. Following the Magician, we now have the Diviner (High Priestess), the Nurturer (Empress), the Founder (Emperor) and the Visionary (Hierophant). I especially appreciate that the Devil is now The Shadow – this feels so much more fitting, I’ve always tied myself in knots explaining the Devil to querents. Lastly, there is an additional card unique to this deck: The Numinous, which is so much about what I recognise as ‘being in the mystery’ and finding your flow. Notes on whats’ included, card quality, etc. I don’t want to get into ‘reviewing’ this deck – that doesn’t feel like the right way to share it – so here are a few brief notes on the actual meat and bones of it. The generous softcover guidebook contains everything you need – even as a complete beginner – to dive in and begin your journey, with an introduction to the tarot and its structure, thoughts on how you might use it, and some spreads to try out, before moving on to a detailed description/interpretation of each card (two pages for the majors, one for the minors). There is so much more I could say about this deck, but (as with all decks, really,) it’s one to discover for yourself. 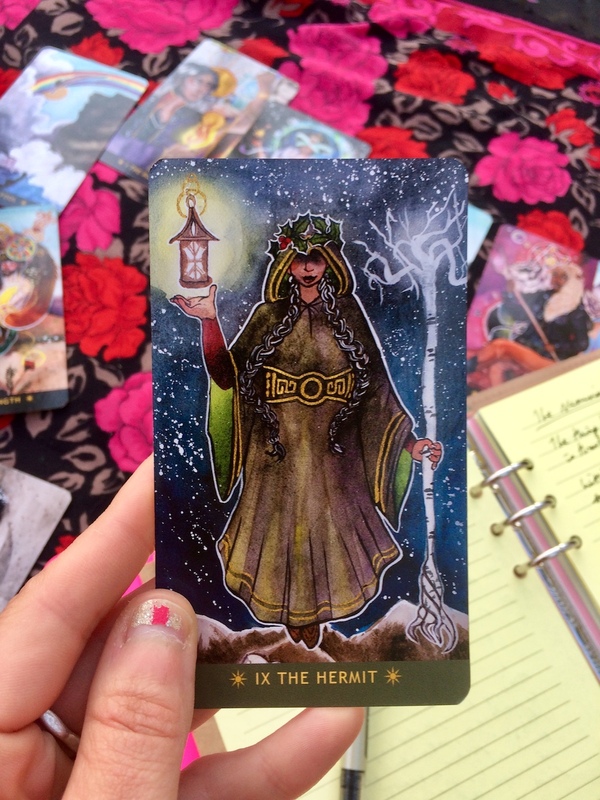 I’m sharing my early-days impressions simply to shine more light onto this creation – I believe that it’s one that is especially relevant to Little Red Tarot readers. You know when you meet a new person and you instantly connect, you just know that your relationship is gonna be fierce, loving and consistently challenging – in the best possible way? That’s how I feel about the Numinous Tarot. The heart of this deck is hope. I started it for myself but I finished it for all the other who have been led to believe that we don’t have a place in the world. We do. We may have to build this place ourselves, but we are worth the effort, the space, and the care of doing so. And I hope this deck helps you to feel that in your own heart. Read Asali’s interview with Noel here: There is space in the magic. Noel is also a comic-book author! Check out their work at noelheimpel.com and support their creations on Patreon here! 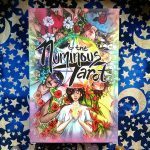 The Numinous Tarot is available in the Little Red Tarot Shop! Following a sell-out first Kickstarter run, a second printing is now available! Yay! 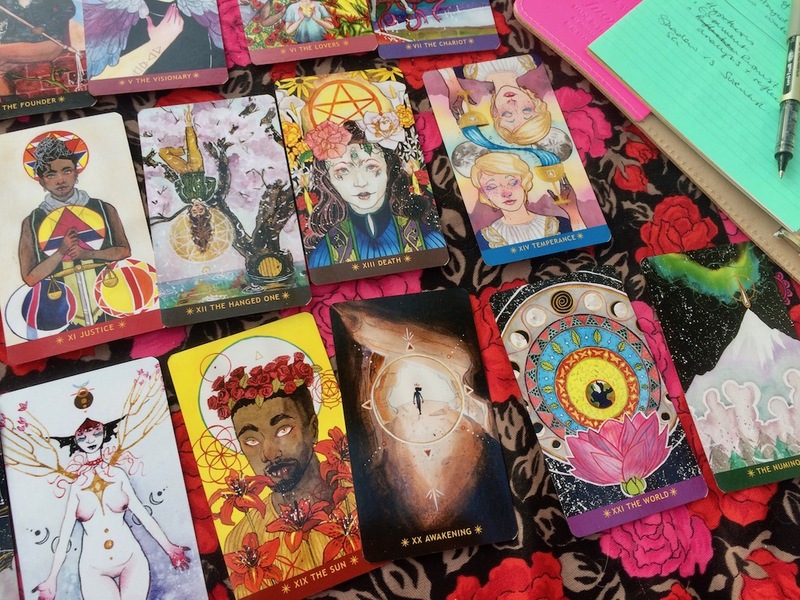 I love the idea that the Numinous Tarot is already being used for the Alternative Tarot Course! Great choice – it’s so rich in colours and symbols – I love how the deck is simple and accessible on the one hand, and yet also is full of symbolism! Have fun Cara! My friend ordered this in the first printing and watching them start their tarot journey with it has made me consider ordering it. Most of my decks are animal decks but I vastly prefer this level of diversity when it comes to decks with people in them. I just got a copy a week ago and it already feels like a dear friend. It’s such a firm and loving deck. It’s been calling for a lot of face up draws – not usually part of my daily practice, but fanning it face up is like holding a handful of beautiful stones and the face up cards have been really incisive. I bought a second copy for a friend who is getting into tarot, and I think it will be a great deck for them. The images are so layered, but not overwhelming and the book is really timely and kind. Love love love this deck. I’m a collector, and I don’t end up using one particular deck more than any other…until now. I love this deck so hard! Everything you said is true, and the amount of love that this deck gives back to the reader is almost unbearable! Love the Numinous! I’ve been watching this deck for several weeks now (missed the kickstarter!) and have been hesitant on whether to spend the money on it or not. I’m 26, about 1.5yrs into a [non-binary] gender transition, and just moved into the first apartment I’ve ever been able to afford by myself. My budget is pretty tight, all I have is a cheap RWS and admittedly a couple months ago I let myself splurge on a first “real” deck purchase (The Moonchild), but your review was exactly what I needed. In my late teens I had finally come to terms with all the feelings I locked away while growing up, and in order to start nurturing the parts of me that had been neglected for so long I had to cut ties with all of my friends and family. Ever since then I’ve been completely alone, bouncing between unhealthy friendships and abusive relationships, desperately chasing the horizon for something I didn’t even know how to put to words. That is, until I came across a few queer, DIY’ers in my early 20’s that brought me in with open arms and changed (read: saved) my life. They didn’t just accept me for what I was or who I was trying to become, they actively lifted me up and went out of their way to help me get the tools I needed to grow. They pursued my dreams with me hand-in-hand, stood by me when adversity struck and fought back when I was too weak to defend myself, and they refused to let me stop believing in myself. For the first time in my life I felt a sense of community and genuine love. Reading what you, Asali, and Noel have to say about this deck made all of those feelings and experiences come rushing back. This review brought me to tears and I cannot wait to have my hands on them. Thank you so, so much.